Wrexham defender Stephen Roberts has confirmed to manager Denis Smith that he will join up with his striker brother Neil at Doncaster Rovers. News of his move filtered out last week, to the surprise of Smith. 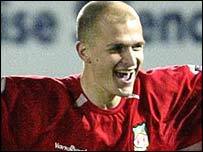 Roberts, 25, was out of contract at Wrexham and keen to secure his future after the club entered administration. "He has done the right thing and told us about the move, now I can set about confirming my retain list," Smith told BBC Sport Wales. Wales international Roberts played a part in Wrexham's LDV Vans Trophy success and has made more than 100 appearances for the Welsh club.